I do like the links – I just started reading your blog a few months ago, so all of the looks back are great ways to see what other recipes you have on your site! I do click on them if they look like something I’d like to make! I actually love it when bloggers include those links. It gives me ideas for what to cook that’s in season and I’ve definitely clicked back on yours! 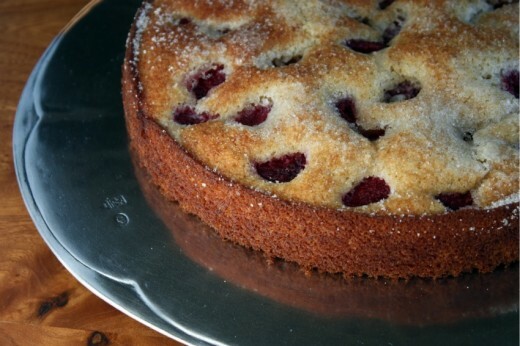 I love simple yet utterly delicious cakes like this that make use of summer’s finest product. The marsala must be such a nice twist. Marsala is a nice surprise here. I’ve never had it in a dessert. Very pretty as well as delicious! Love this cake! I forget all the good recipes I make during the year, so I like the reminder links. I love the look back- and often find treasures from years past. hope you keep doing it! Yes! I do click back! And the cake looks yummy… on the list for this week for sure. Yes I enjoy the the links too! I started reading your blog only within the last year, so I often click back to another yummy seasonal recipe. Love your writing and your recipes – thank you! I also like the links. The snapshot view of the past is fun. 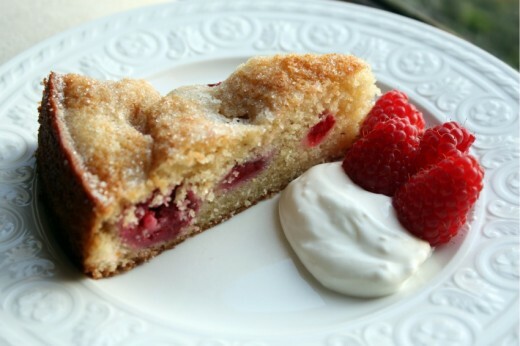 But I really want to try the Raspberry cake with marsala, lemon and orange. Scrumptious tastes of summer. I frequently click the links to old recipes :) I know I’ve discovered some great ones I missed the first time around!! Thanks, Dana. Yes, I like the click backs too! This cake looks lovely, and looks easy to convert to gluten free too. I like seeing recipes from years past. It has introduced me to dishes I would otherwise overlook. Thank you for taking the time to do this for all of us. I also love the links to the previous years’ recipes! I agree with everyone else about the links…even when it’s a recipe I’ve already looked at and bookmarked in the past, it’s nice to be reminded of them again! Yes, I love your links at the bottom, it’s an extra bonus getting more than one recipe per blog post! 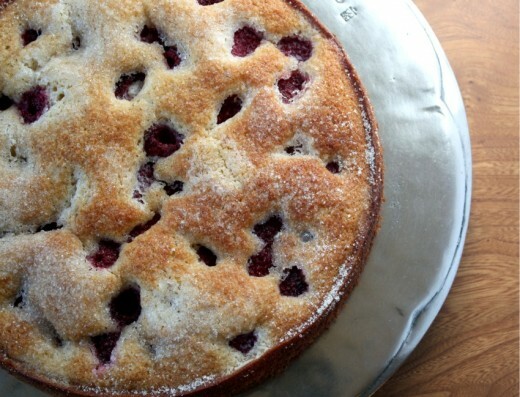 And I’m thrilled you (re) posted this raspberry recipe. I just picked a ton of berries at my MIL’s house and have been looking for things to make! I love your website and I definitely use the links. I am more of a fan of savory recipes, but this cake does look good. This does show off the raspberries nicely! And, now I’m wishing I could get late summer raspberries here. Also, I’m reminded that I need to try making my own creme fraiche. I am a long time reader, but first time commenter…just wanted you to know that, like most every other person who has posted a comment, I love the links you include to the previous years’ recipes. I click on them often and enjoy the “bonus” of reading another post and reviewing a recipe I may have forgotten about. Keep up the wonderful work! A perfect cake wih a cup of tea! Dana! Congrats on the new classes…wow, they sound amazing. So happy it’s going well. I also click on the links. I don’t have them on my blog only because I don’t really know how to do it, but I think as a blogger it must be nice, too, to kind of chronicle what you’ve been up to each year. And — how cool to have a recipe that you repeat year after year around the same time? That, in and of itself, makes me want to whip up this cake very, very soon. Hope you’re well, my friend! I love the links too! 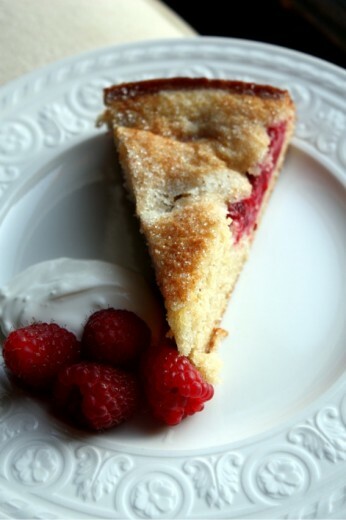 And that cake sounds fantastic and so simple – perfect for raspberries. We had a really special gathering with our oldest group of friends last night and this was a hit. I was so pleased because several in the bunch are pretty amazing in the kitchen and therefore, even their spouses are spoiled :) (I felt as nervous feeding them as I would you!) Thanks for sharing such a delicious treat.